May 2017 – Click here to view the full Press Release. On Tuesday 16th May the management and staff at one of Irelands leading timber processors ECC Timber welcomed Minister for Forestry Andrew Doyle to the company’s headquarters in Corr na Mona, Co. Galway. ECC process round logs into quality timber products for Construction, Fencing and Packaging markets in Ireland and the UK. 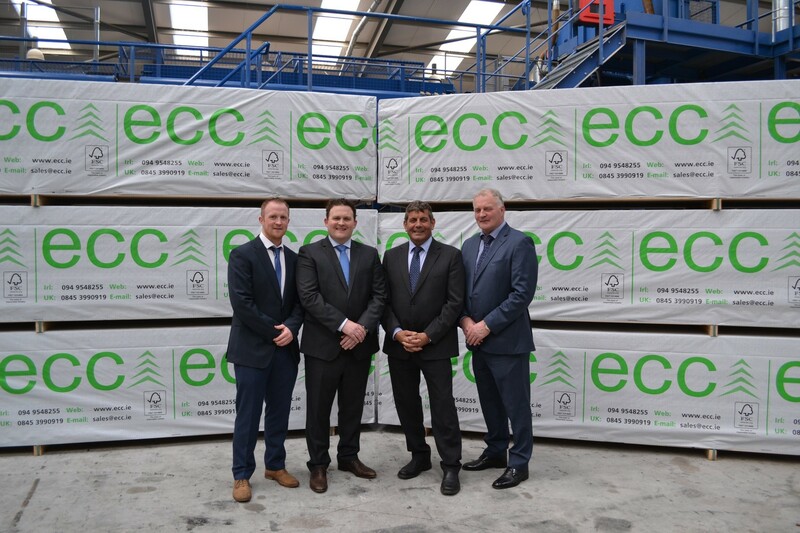 Based in the scenic west of Ireland, ECC has grown under the leadership of PJ Fahy to become the largest exporter of sawn timber in the country with over 280 people in fulltime employment. The visit by Minister Doyle coincides with the company’s 25th year in business and also the first visit by a Government minister since the Fahy family took 100% ownership of the company in 2016. During the visit Minister Doyle was given a tour of the plant showcasing the extensive investment and importance use of technology throughout the process in PLC control, scanning technology and X-ray density grading processes. The visit also highlighted the success of an Irish Forestry company in establishing itself as a major supplier to Irish and European timber markets. Commenting on Brexit, Managing Director Daryl Fahy is confident of prospects for the timber industry in the UK, he said “The UK market is the largest timber market in the world per capita and must import over 70% to satisfy its timber requirements. This demand combined with our reputation for service and quality will safeguard our share of that market, overall we look forward to increased demand from both Irish and UK markets”. To conclude the visit, PJ Fahy expressed the gratitude of all staff to the Minister for his visit and thanked him and the government for their support of the forestry Industry. Pictured (L-R): Conor Fahy ECC, Daryl Fahy Managing Director ECC, Minister Andrew Doyle, PJ Fahy Chairman ECC.